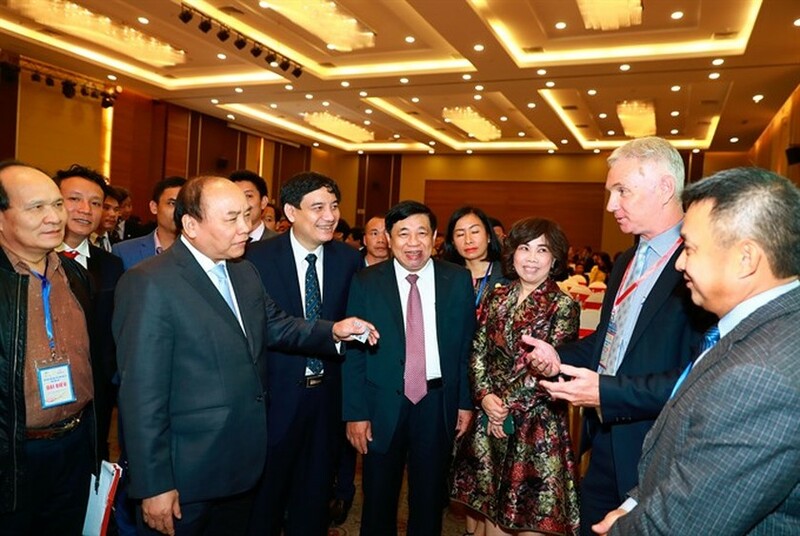 Prime Minister Nguyen Xuan Phuc yesterday advised businesses in Nghe An to devise long-term strategies that utilise the many advantages enjoyed by the central province. He was speaking at the province’s annual Spring Festival sponsored by the Bank for Investment and Development of Vietnam (BIDV). The province is the birthplace of late President Ho Chi Minh, is located on a strategic transportation junction as the centre of the north-central region and the north-south and east-west exchange route, has road, railway, aviation, seaway and inland waterway links and serves as a gateway to the East Sea from central Laos and northeast Thailand via the Thanh Thuy border gate. Nghe An is also endowed with vast land and abundant human resources, including more and more intellectuals and engineers returning home to do business. It has built eco-friendly projects and made infrastructure breakthroughs to serve socio-economic development. The Prime Minister suggested that the province prepares a master plan for sustainable development of industry, agriculture and infrastructure, boost connectivity with the south of central Thanh Hóa Province and the north of central Ha Tinh Province and accelerate administrative reforms. The province should also protect and effectively tap natural resources, ensure public involvement in science, education and healthcare sectors and attract investment in high value-added products and services, he said. Social security and safety must be ensured, especially in mountainous areas, he said. "While the Government is determined to develop the economy, the living environment will not be traded for such growth. The Government is also resolved to having a transparent, constructive, action-oriented cabinet that will protect people’s rights and their assets," he said. He pledged that the Government would also strive to develop a pro-business environment, maintain macro-economy stability and foster an environment of peace and friendship. Incentives would be offered to investors in the supporting and high-tech industries, as well as tourism, the PM said, adding that he hoped Nghe An would take the lead in such areas. Chairman of the Nghe An People’s Committee, Nguyen Xuan Duong, said they had identified nine comprehensive measures to make Nghe An an attractive business destination in the near future, including simplifying administrative procedures and reducing the time for granting investment licences to three days or even one day, and launching online public services at the ASEAN 4 level for business registration. On the occasion of the Spring Festival, provincial authorities granted investment licences to eight projects and signed 15 memoranda of understanding and co-operation agreements valued at over VND22.62 trillion (US$983.8 billion). It was the ninth time that BIDV was sponsoring the event, which attracted hundreds of enterprises and investors at home and abroad. Also attending the event were former National Assembly Chairman Nguyễn Sinh Hùng and Deputy Prime Minister Vuong Dinh Hue. In the past nine years, Nghe An attracted 804 projects worth more than VND261 trillion ($11.34 billion), including 758 ones worth more than VND101.29 trillion ($4.4 billion) and 46 foreign-invested ones with a total registered capital of over VND160.43 trillion ($6.97 billion). This year, the province targets attracting over 100 projects worth VND30-35 trillion ($1.3-1.5 billion) and generating jobs for 13,000-15,000 workers. A ground breaking ceremony for a shipping container factory invested by the TKV Group from the Republic of Korea was held in central Nghe An Province on Saturday. The project in the Dong Nam Economic Zone has total registered capital of VND550 billion (US$24.2 million). It is expected to be completed in June 2018 and produce 6,000 shipping containers a year. At the ceremony, Le Ngoc Hoa, Vice Chairman of the Nghe An People’s Committee, pledged that the province would create favourable conditions on policy and investment environment for investors. The TKV Group hopes to continue cooperating with Nghe An to implement several projects in the future, including a high technology university, health waste treatment factory, and developments in the field of electronics. A cattle-feed factory with total investment of VND325 billion (US$14.3 million) was inaugurated in central Nghe An Province on Saturday. The Mavin Austfeed Nghe An factory has a capacity of 300,000 tonnes of domestic animal feed per year and generates jobs for 300 local workers. Construction began in September 2015 on an area of 3.6ha in Block B, at the Nam Cam Industrial Park, in the Dong Nam Economic Zone. Speaking at the inaugural ceremony, Nguyen Xuan Dưong, Chairman of the provincial People’s Committee, said that the factory would be a driving force for investment in the Dong Nam Economic Zone, contributing to the socio-economic development of Nghe An Province.